Can Setting Out Tables, Painting Street Murals Transform Honolulu’s Neighborhoods? A new Honolulu program encourages residents to create do-it-yourself “pop-up” urban design projects to make their communities safer and more walkable. Early next year, Honolulu neighborhoods will get a chance to turn their streets into murals or transform metered parking spaces into parks. Inspired by do-it-yourself, guerrilla urban planning projects, which became popular in American cities over the last decade, Honolulu’s transportation department hopes the new approach will get communities engaged in projects that get people out of their cars and make Honolulu more walkable. And hopefully, make the streets safer. The program won’t launch until early 2019, and kinks are still being ironed out. But the idea is to allow community groups to identify a dangerous street or intersection and propose a way to improve it. The city will offer materials and technical know-how, but community members will actually go in and build the project alongside the city’s crew. A public seating area in Kakaako was an early attempt by Honolulu planners to claim metered parking spots for pedestrians. Project ideas could include new bike lanes, roundabouts, curb extensions, mini-parks or an artfully painted crosswalk. At least initially, the streetscape changes are meant to be temporary. But if the community likes the changes, the projects can stay. Honolulu is joining a national trend. 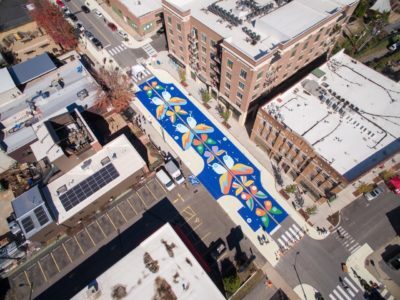 A 6,000 square-foot mural on Cox Avenue corridor in Asheville, North Carolina by tactical urbanism pioneer Tony Garcia. A 2005 project by San Francisco-based planner John Bela popularized the idea using low-cost materials to alter public space on the fly, transforming spaces for cars into spaces for people. Bela and fellow urbanites fed coins into parking meters in downtown San Francisco, covered the parking spaces with a sheet of grass, added a bench and potted tree, then watched as people started hanging out there. The project ignited a now world-wide event called Park(ing) Day, when parking spots are converted to so-called “parklets.” In time, municipal transportation departments took notice and institutionalized the DIY trend. For now, regulations make similar projects in Honolulu almost impossible. 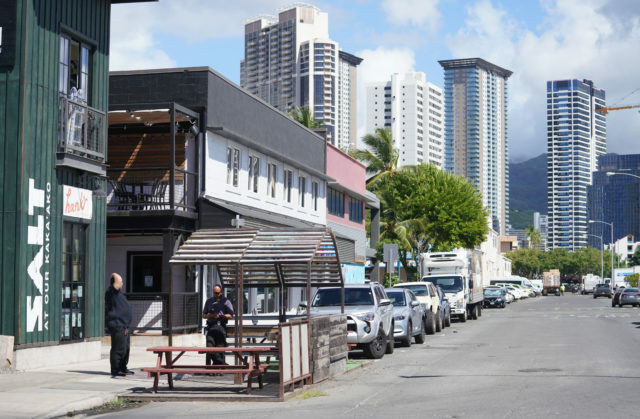 Gaining approval to turn a few parking spots into a public, outdoor seating area in Kakaako was painfully bureaucratic, said Harrison Rue, the city’s Community Building and Transit-Oriented Development Administrator. “We’re essentially trying to make the rules to make the pop-up aspect easier,” said Honolulu planner Nicola Szibbo. In most American cities, 80 percent of paved public space is dedicated to cars. The number of pedestrian fatalities in Hawaii increased by more than 500 percent from last fall, according the state Department of Transportation. The number of deaths reached 36 last week, the highest number of fatalities in a year since 2005. In 2012 the city adopted a policy called Complete Streets that aims to make the city safer for pedestrians, bike riders and passengers using public transportation. Rather than wait for long-term capital projects which can take years to get funded and built, local planners are embracing “tactical urbanism.” In essence, it means using low-cost materials to quickly build things that make streets safer for people on bikes and pedestrians. The goal is to claim more street space for people, rather than people in cars. The city’s already tried a handful of projects, including using potted plants and paint to create curb extensions in Chinatown and building the King Street bike lane. The approach allows the city to do more with less, and do it quickly. “It’s a great approach to getting stuff done in a city where bureaucracy and politics and money can get in the way of perfectly good planning,” Gordon Douglas, a professor at San Jose State University’s urban and regional planning department. The program launching next year might give community members a chance to try projects that city officials have rejected in the past. 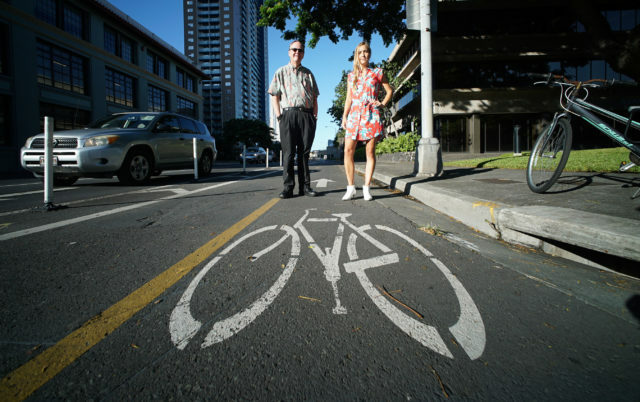 Community pushback against the city’s Complete Streets projects have made the streetscape changes a point of contention between the Honolulu City Council and the Mayor Kirk Caldwell administration. In May the council passed a bill that would allow it to have more control over which Complete Streets projects get built in Chinatown, but Caldwell vetoed the bill. Similar initiatives in other American cities have divided communities. To be successful, Honolulu’s tactical urbanism program must find ways to engage low-income communities or run the risk of only serving the wealthy, said Douglas, the San Jose State University professor. 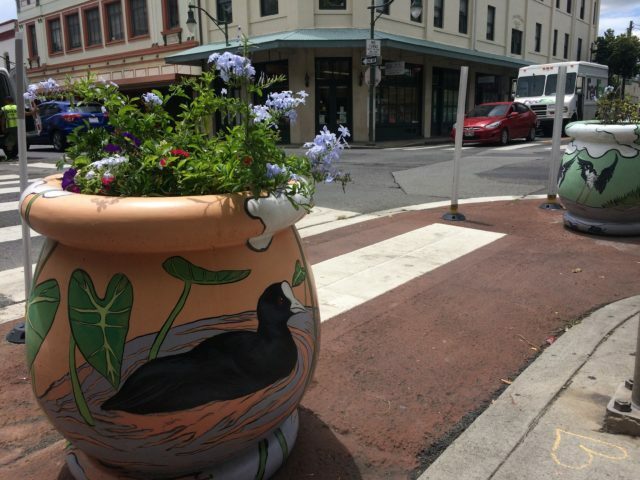 Decorative planters are used in Chinatown to extend curbs for more pedestrian use. Honolulu’s new program, which doesn’t yet have a name, aims to make the top-down Complete Streets projects come from the bottom-up. That will help ease the resentment that can build up if the city fails to earnestly listen to community concerns on the front end, then holds press conferences to tout the success of Complete Streets projects, said cyclist David Jung, who attended the city’s meeting on tactical urbanism in September. 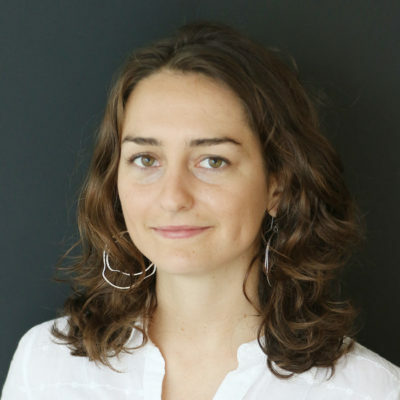 Jung sees the city’s new program as a way to break down communication silos between planners and community members and try short-term, innovative projects. “Tactical urbanism allows you to do things in an incremental format, try a little here, try a little there,” Jung said. With community buy-in, the project can stay for good.